In Almere's new suburb of Almere Poort, private patronage at the instigation of alderman Adri Duivesteijn took flight in the shape of faux farmhouses and thirties-style villas. A residents' cooperative of five families had their own shared dwelling designed. 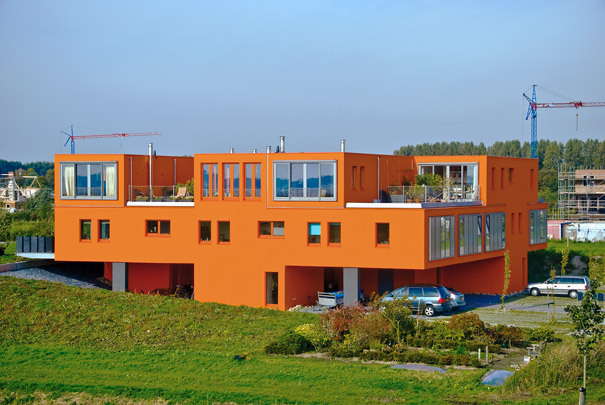 Resembling a single large villa, its units are elevated so that each has a view across the dyke to the waters of Gooimeer. All five are long and narrow on plan and stand in a row. With their first and second floors turned 90 degrees, all dwellings look out in four directions. Each has a terrace and a roof garden with the entrances, a shared zone and parking space on the ground floor. The striking orange colour makes for a vivid contrast with the green setting.